Suggested citation: Atukpawu-Tipton, G., & Sparr, M. (2019, January). 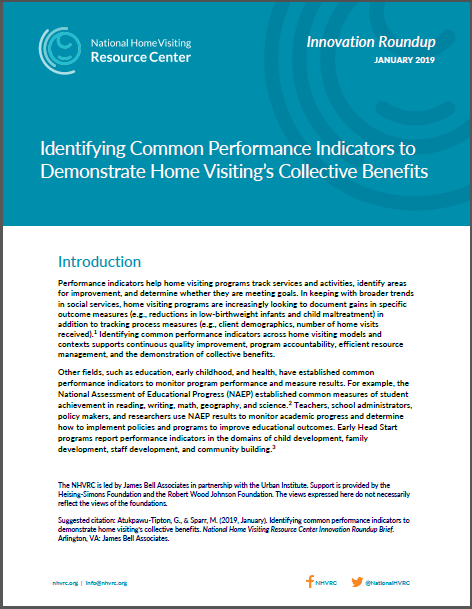 Identifying common performance indicators to demonstrate home visiting’s collective benefits. National Home Visiting Resource Center Innovation Roundup Brief. Arlington, VA: James Bell Associates. Special thanks to Deb Daro and Sacha Klein for their expert feedback and guidance on this brief.